How’s that for a stage profile? Can Andy attack Alberto? Will Moreau take Polka Dots. The answer may depend on which rider most enjoys riding in the rain. The forecast is for wet. Before the 3 main climbs, the route climbs the category 4 Cote de Renoir. Expect some good road painting here. This is the shorter, steeper side of Marie-Blanque. A tough start to the day. Obscure Fact: Marie-Blanque is a relatively low Col? Where are the trees? Many were cleared to build 18th century French war ships. Unlike stage many of the Pyrénées climbs that regularly appear, Marie-Blanque is relatively new to the Tour, first appearing in 1978. That year the Belgian Michel Pollentier was first over the top. While in Yellow, a few stages later, Pollentier was kicked out of the Tour when his rubber bladder with a fraudulent urine sample was discovered at doping controls. Oops. In the 1989 Tour, Laurent Fignon finally got Greg Lemond to agree to share the work at the front on Marie-Blanque. But only briefly. Fignon went on to attack the “suceur de roue” (wheelsucker) in the press at the end of the stage. Lemond, of course, got the last laugh: winning the GC by 8 seconds. 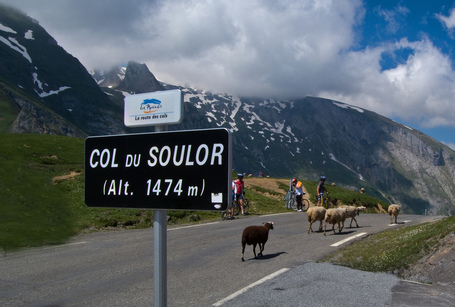 Col du Soulor makes frequent appearances in the Tour. 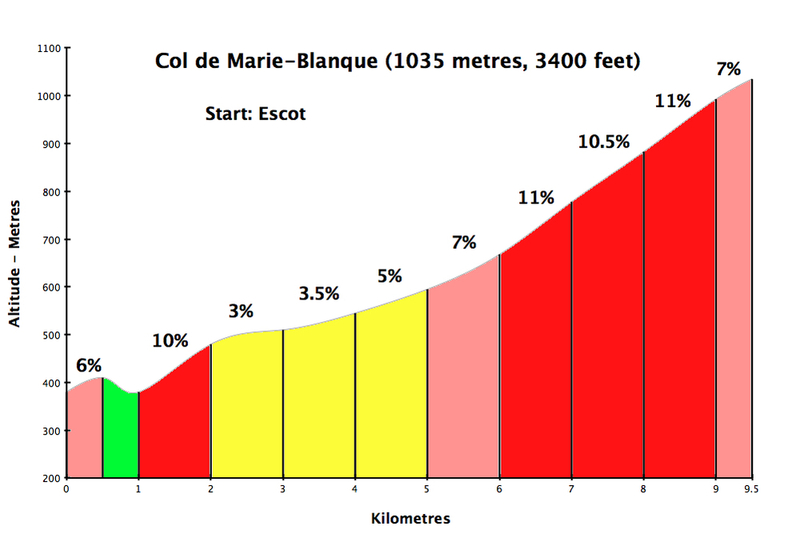 Almost always as part of the east-west ascent (or west-east descent) of Col d’Aubisque – for example in Tuesday’s stage. 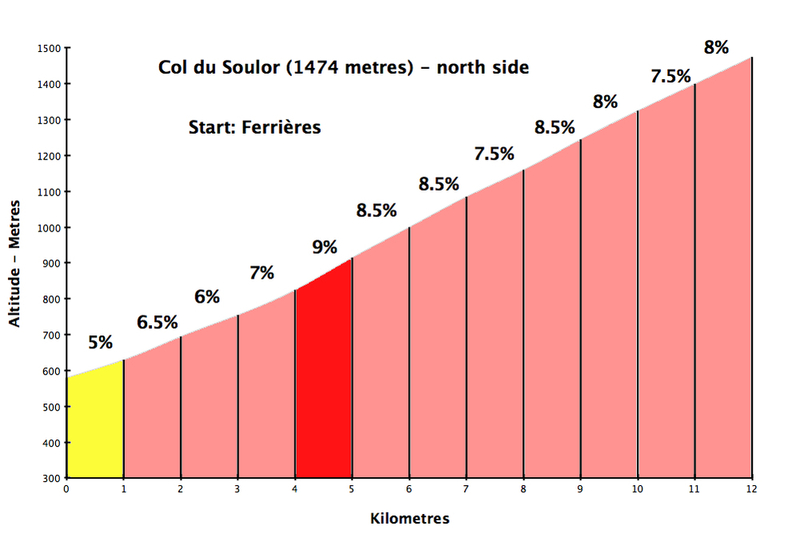 If you have cycled in the Pyrénées you probably know Soulor, but I’d guess you haven’t ridden today’s version. 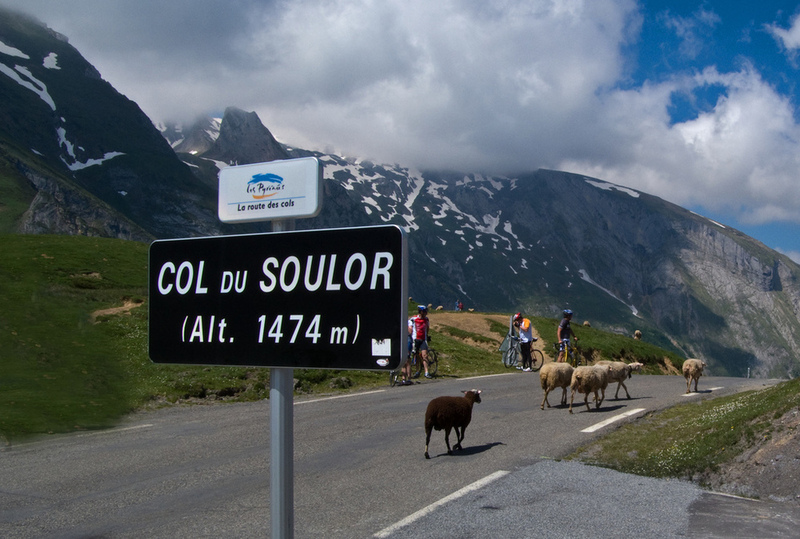 Stage 17 is taking a lessor known, very quiet, very scenic route from the north – it’s also steeper than the standard Soulor. The riders will be faced with a perfect view of Cirque du Litor while climbing, but at the top will turn left for the Tourmalet instead of right for Aubisque. 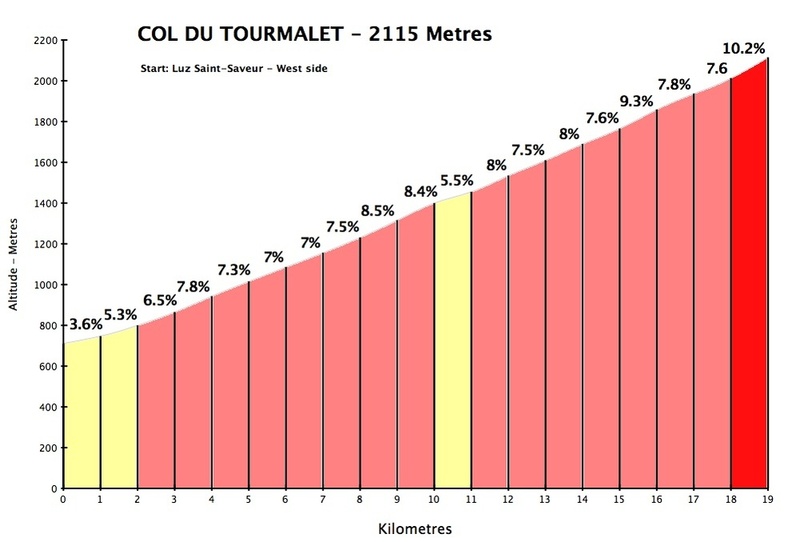 This is the hardest climb in the 2010 Tour. 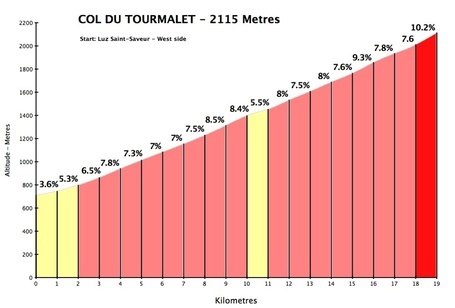 This stage celebrates the 100 year anniversary since the first appearance of Tourmalet in the Tour de France. It has appeared over 70 times, but this will be only the second mountain top finish here. The first, in 1974, was won by Jean-Pierre Danguillaume. 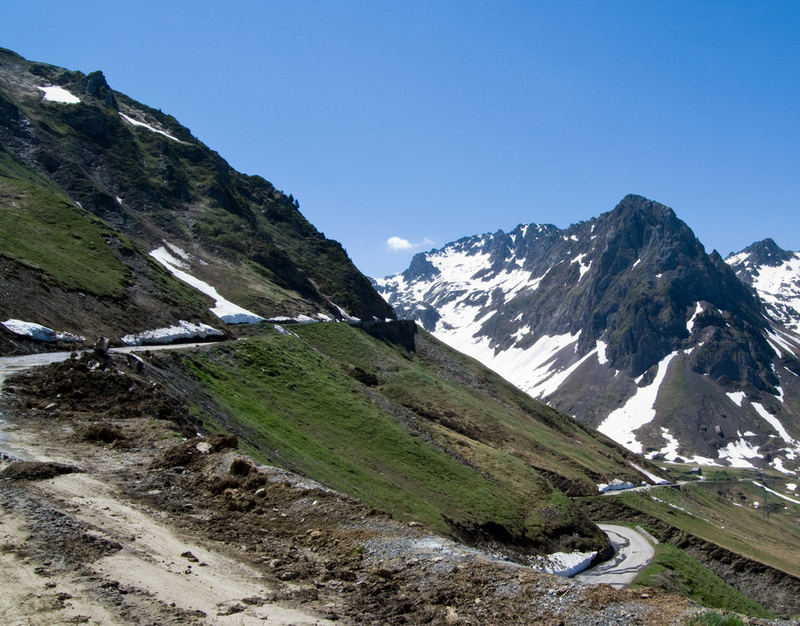 For me, this is the more beautiful side of Tourmalet (the ugly La Mongie ski station scarring the other side). After passing Barèges – 10 kms from the summit – there are no more towns. 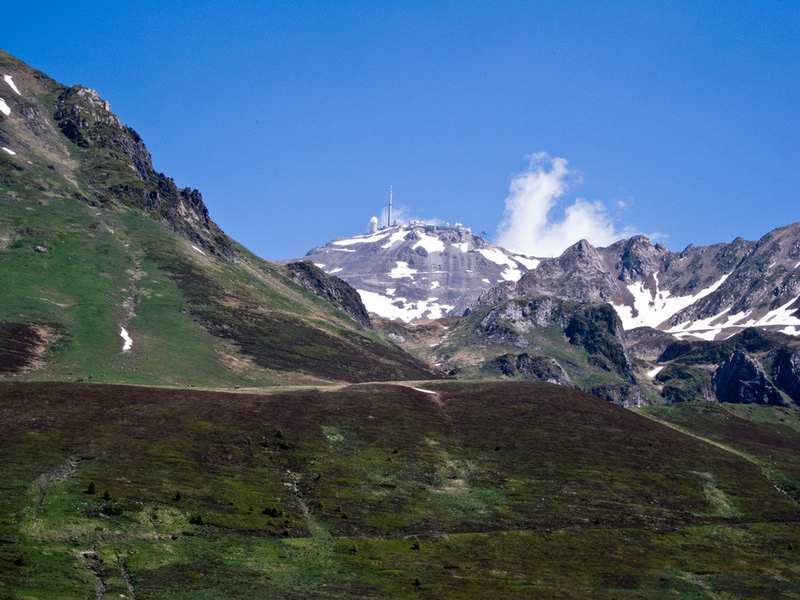 Just wonderful views, especially of the Pic du Midi de Bigorre. The Pic du Midi is accessible all year by Cable Car from La Mongie. The distinctive white buildings on top include an observatory with night time star viewings open to the public. As a friend proved last year, for the brave, it is accessible by mountain bike. The last hairpin-filled stretch to the Col is on a tight cliff road. The top has very little room. If you are going to watch in person and want to be at or near the summit, leave very early. It will be bedlam and access soon blocked by the gendarmes. Trivia: Stage 16 had the Jacques Goddet prize. 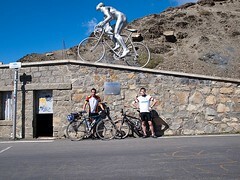 His statue is at top of Tourmalet. Today the winner receives the Henri Desgranges award. Which famous Col has a monument to Desgranges? Sadly, I don’t have any pictures of the Géant du Tourmalet statue at the top, as when I was here it was too early in the season. For the last 11 years, hundreds of cyclists accompany the statue in a special event as it is driven up to the top. Many of the cyclists wearing vintage cycling gear. This year’s edition had a special guest: Bernard Hinault! And the start of the event down low? The Laurent Fignon Cycling Centre. The Badger’s thoughts: “It’s most of all a climb very demanding, very testing. 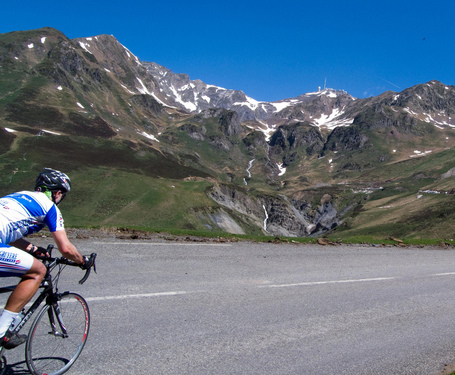 Probably one of the hardest in the Pyrénées, if not the hardest.” Sounds good to me. Previous Article2010 Tour de France Stage 16 Preview – Tourmalet!